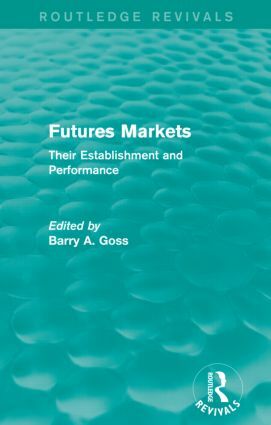 First published in 1986, this book discusses many important aspects of the theory and practice of Futures Markets. It describes how they, at the time, grew to be an increasingly important feature of the world's major financial centres. Indeed, they adopted the role of being efficient forward pricing mechanisms and this was reflected by the interest of economists in the study of risk, uncertainty and information. Here, the contributors focus on areas that were of concern in the late 1980s such as feasibility, forward pricing and returns, and the modelling of price determination in Futures Markets. Evidence is drawn from twenty-five different commodities representing all the major commodity groups; and from all the world's major centres of Futures Trading.